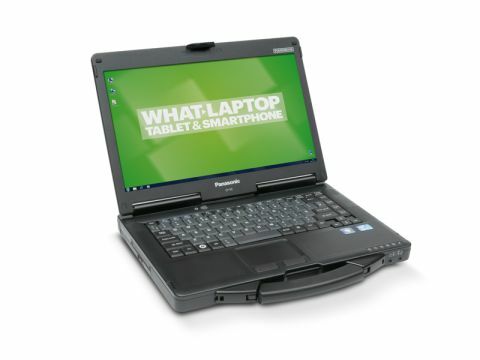 Panasonic has three classes in its Toughbook range: Fully ruggedised, semi ruggedised and business ruggedised. The CF-53 is part of the semi-ruggedised range and is therefore balanced between durability and performance. It's not meant for exploring the Masai Mara, but it's a perfect machine for the bumps and knocks of a travelling business professional or anyone who often works outside. The build quality is better than anything we've seen recently and Panasonic has taken care to make the design as appealing as it is usable. The silver lid has slight structured ridges in place, and lifts on solid hinges after being unhooked from the chassis. The keyboard is compact and located in the centre of the chassis with space either side for the speakers. Unsurprisingly, there was no flex around any part of the keyboard or touchpad. The solid design means that you can drop the Toughbook from up to 76cm without affecting performance. So there's no need to worry if it takes a tumble from either your desk or your lap. Panasonic has added a handle to the base of the CF-53 so you can carry it around like a briefcase. Just beware that at 2.7kg, it's not that light. The compact keyboard limits the amount of dust and grime that can get between the keys. Any liquid spilled over keyboard will filter into grooves laid underneath the keys and run out the side of the chassis. The 14-inch display is capable of Full HD detail, but lacks a Super-TFT coating. That means you won't get distracted by reflections when using the laptop outside or in brightly lit areas. Obviously, movies and pictures won't look as good as on a Super-TFT screen, but the CF-53 sticks resolutely to the 'form follows function' rule of design. Panasonic has built the Toughbook around an Intel Sandy Bridge Core i5-2510M processor, which coped very well with our tests. The added 4GB of RAM is the minimum you would expect on a business machine at this price. There's no dedicated graphics card, as this machine isn't designed for playing games. However, the integrated Intel HD 3000 GPU will be able to easily handle less complex tasks such as browsing detailed websites. The CF-53 has a 320GB hard drive, which again is pretty standard nowadays, but a very impressive battery life of 273 minutes. As this is a device made for travelling, there are plenty of ports for peripherals, including three USB 2.0 and one USB 3.0 socket. There are both HDMI and VGA Out connections for using the Toughbook with an external monitor. All the connection ports (except the headphone and microphone sockets) are protected by plastic shields.